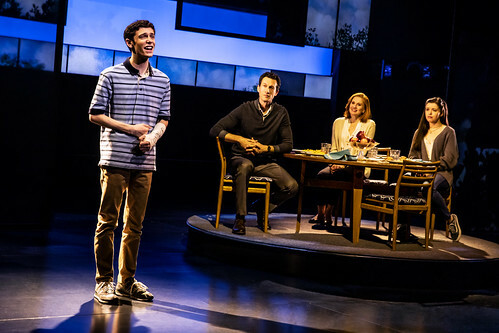 The cast of the Dear Evan Hansen tour includes (from left) Ben Levi Ross as Evan Hansen, Aaron Lazar as Larry Murphy, Christiane Noll as Cynthia Murphy and Maggie McKenna as Zoe Murphy. Below: Ross’ Evan seeks connection in an isolating age in the Tony Award-winning musical at the Curran. Photos by Matthew Murphy. 2018. It’s absolutely astonishing that a musical about pain – in itself a painful experience – can be so enjoyable. But Dear Evan Hansen is a deeply felt show that wrings tears but is so artfully crafted that its pain is also a pleasure. This is also a show that managed, in the shadow of Hamilton a season before it, to become its own kind of phenomenon. Much of the credit went to original star Ben Platt, who originated the role of the title character, a high school senior whose discomfort in his own skin much less the world around him is palpable. There were also plaudits for composers Benj Pasek and Justin Paul for songs that felt vital and contemporary yet still carried emotional weight within the trajectory of the plot. 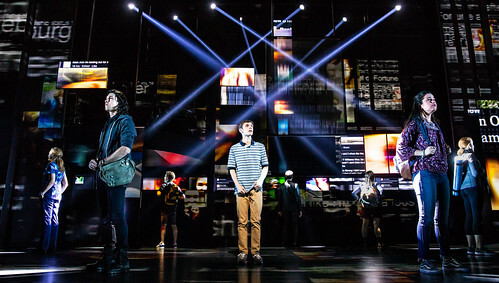 Songs like “Waving Through a Window” and “You Will Be Found” quickly took on life outside the musical, making Evan Hansen the show people wanted to see (after Hamilton, of course). Producers wisely put the show on the road as quickly as possible, and the good news is the touring company now at the Curran is every bit as powerful and moving as the Broadway production. Platt’s shoes are awfully hard to fill, but Ben Levi Ross gives a remarkable performance as Evan – naturalistic enough to feel real but theatrical enough to make breaking into song feel like it makes total sense. Keeping that tricky balance is a distinguishing feature of director Michael Greif’s work throughout the show. This is an intimate musical – only eight characters – that is (as hard as it is to believe these days) not based on a book or a movie or a cartoon or meme. It’s an original story by book writer Steven Levenson about the power of the truth. When a classmate commits suicide, Evan is mistakenly identified as a close friend of the deceased. What’s surprising is neither Evan nor his supposed friend, Connor Murphy, had any friends. Evan is almost pathologically shy and has trouble navigating even the smallest social interaction and Connor was a rebel who spent most of his time angry and high. Still, once the connection between the two boys is made, the misunderstanding quickly leads to lies of increasing size and significance. Evan finds himself caught in a difficult place where he doesn’t want to disappoint Connor’s family, who are so surprised and delighted Connor had a best friend, so he doesn’t correct their misapprehension. And once he’s embraced by the Murphy family, his miserable life as a lonely kid of an overworked single mom is suddenly brightened. Evan’s mom is loving and doing her absolute best juggling a son, a medical career and night school, but here in Mrs. Murphy, Evan finds a surrogate mom who is happy to cook for him and talk to him and not want to fix all of his, as he puts it, “broken parts.” And here’s a dad who, unlike Evan’s dad who bolted years ago and started another family, shows interest in him and actually acts like a dad. To further complicate things, Evan has long harbored a crush on Connor’s little sister, Zoe, and now that he’s spending all this time in the Murphy house making up a friendship full of imaginary incidents, he can’t help but feel the complicated pull of his attraction. As Evan and the Murphys grow closer, Evan’s fellow high school students rally around him as the flashpoint for all things Connor Murphy until Evan becomes a viral sensation promoting inclusion and kindness and the notion no person should ever feel so alone or forgotten that they take their own life. Dear Evan Hansen is a musical built on discomfort. Evan’s physical presence telegraphs discomfort at practically every moment (something Levi does with such natural efficiency that it never feels affected), and once he begins what will become an avalanche of lies, the anxiety level only goes up and up. And yet the audience is fully with the show, especially with Evan, whose behavior is understandable even if you want to scream at him and prevent him from digging in deeper and deeper. By Act 2, when the Internet has blown Evan’s lies to terrifying proportions, the whole thing has to come crashing down. So it does, but not in a punitive way. More in an emotional, prepare-for-an-ugly-cry kind of way. The whole cast is superb, with Jessica Phillips as Evan’s mom really coming to life in Act 2 with a raging “Good for You” and a heartbreaking (truly) “So Big/So Small.” Aaron Lazar as Connor’s dad delivers a beautiful song/scene with Evan in “To Break in a Glove” that masterfully deals with a father’s grief and disappointment, and Christiane Noll as Connor’s mom is like an open wound of regret and delusion. Maggie McKenna as Zoe, Connor’s sister (who is not a Connor fan) and Evan’s love interest, is astonishingly natural as a young person who thinks she has things figured out and is mostly dismayed that she really doesn’t. Her love duet with Ross, “Only Us,” has a beautiful simplicity to it, like something two young people who are just finding each other, might actually express. And the other teenagers – Marrick Smith as Connor, whose death does not prevent him from being an active character; Jared Goldsmith as Evan’s reluctant, ever-acerbic friend Jared; and Phoebe Koyabe as Alana, an ambitious senior unafraid of creating opportunities for herself – are equally as effective, with Goldsmith contributing the bulk of the show’s welcome comic relief. They say the truth shall set you free, and that’s true. But what they don’t say is how hard it can be to even get close to the truth. There’s the crux of Dear Evan Hansen right there. Evan can twitch and dodge and apologize and be uncomfortable all he wants, but he can’t face the ultimate truth about himself and just how in need of help he really is. And his mom and the Murphys are just as reluctant, in their own ways, to acknowledge what they most need to acknowledge. This is such a beautiful, painful and deeply human show – our flaws and our salvation, the pain and the beauty, are so intricately intertwined, it’s hard to tell one from another. Dear Evan Hansen continues through Dec. 30 at the Curran Theatre, 445 Geary St., San Francisco. Tickets are $99-$325. Call or visit sfcurran.com. DAILY DIGITAL LOTTERY: Lucky Seat hosts a digital ticket lottery for a limited number of $25 tickets available per performance. Visit luckyseat.com/dearevanhansen until 9 a.m. the day before the performance you’d like to see and follow prompts to enter the lottery.